Description: U347-26, Rice street overpass, 11:45 hrs. Description: An empty Stilesboro coal train runs for the law trying to get back to EtowahTN before the crew runs out of time. Description: Q631 southbound, note RCO flat tucked in behind power. 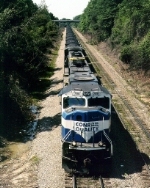 Description: Q631 southbound, note RCO flat behind power.